My parents visited us in Dallas last weekend, and let me just say I was excited beyond belief in the days leading up to it. They are so cute and fun, and they like eating as much as I do. It turns out that trait is genetic. They were only coming for 2 nights so we decided to eat out both nights, but I wanted to make something to celebrate their arrival. We're a dessert family, so it was obvious I needed to make something sweet. I did have one obstacle: my dad has to eat gluten free. YES. A baking challenge. Bring it on. I thought about getting GF flour, or rice flour, or something like that - but I have made baked goods with those items before and they are never as good. 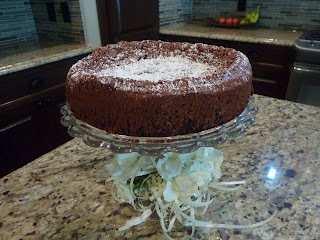 So, I decided to make a flourless chocolate cake to keep things authentic. And OH MAN. IT TURNS OUT I LOVE FLOURLESS CHOCOLATE CAKE. This is my own recipe for the most part, using several different recipes as my guidance. All flourless chocolate cakes have lots of eggs, chocolate, sugar, and butter. I have never liked how bitter and dense most flourless cakes are, so I made changes accordingly. I used a combination of milk- and semi-sweet chocolate instead of bittersweet, I added coffee to bring out the delicious chocolate flavor, and I whipped the egg whites to extreme stiffness to make the cake more crumb-y (is that a word?) like a real cake. And I added vanilla, because I add vanilla to everything. Preheat the oven to 350. Grease a 9 inch spring form pan, and line the bottom with parchment paper. Grease the parchment paper. Start by melting the butter and chocolate in a large saucepan over low heat. Meanwhile, separate the egg yolks and egg whites into two different bowls. In order to get a lighter and fluffier cake, you will want eggs at room temperature. If you did not take them out of the fridge in time, just put them in a bowl with luke warm water for about 10 minutes or so. Place the yolks in the bowl of a standing mixer. Add in the sugar, and beat on medium-high for about 5 minutes, until the mixture is light yellow. When the chocolate mixture is completely melted, add it SLOWLY into the yolk mixture (you don't want to scramble the eggs from the heat). Stir until combined, then add the coffee and vanilla. Taste a bit with your finger (just to make sure you're on track). Next, beat the egg whites. For a lighter, crumbier cake, beat the egg whites until they form very stiff peaks (about 5 min). If you prefer a denser, fudgier texture, beat the egg whites until soft peaks form. Gently fold the egg whites into the chocolate mixture, careful not to over stir or deflate the whites. This gives the cake its volume. Pour the batter into the pan, and bake at 350 for 25-30 minutes. 25 minutes for a bit of a molten center (which is what I did), and closer to 30 if you prefer the middle to be more well done. Finish the cake with a dusting of powdered sugar, and serve it with vanilla ice cream. Flourless chocolate cake, who knew you were so good??! I am hoping the taste it left in their mouths will lure them back to Dallas again soon, I miss them already.